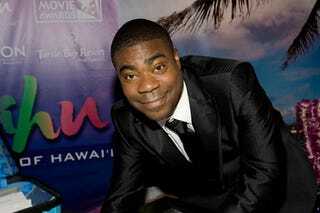 From Tina Fey to Luke Wilson, celebrities cannot stop impersonating Tracy Morgan. But it takes more than a belly rub and an exclamation about getting someone pregnant — and celebs are working overtime to pull this one off. Click to viewLuke Wilson's impression isn't the best, but to be fair, he and Tracy didn't get to know each other that well on the set of Death at a Funeral. Just because they spent every day together, doesn't mean Tracy knows Wilson's name. The Hurt Locker's Anthony Mackie has the mannerisms down, but he falls back on the "somebody's gonna get pregnant" line. So cliché! Click to view Jay Mohr is better at capturing Tracy's bizarre banter, and he gets bonus points for hitting on Rachel Ray in character. Click to viewTina may not understand who "Jack Human" is, but she does get Tracy. File this one with her Palin routine. Click to view Director/comedian Neal Brennan presents some stiff competition, performing his Tracy Morgan impression in front of Tracy Morgan. Click to viewBut we all know who the master Tracy impersonator is: Alec Baldwin. First, he set the bar the bar with what is possibly the greatest thing to come out of 30 Rock, Alec does not just Tracy, but his entire family — and makes Tracy stop dog fighting. It's become quintessential, but Alec hasn't stopped there. Click to viewAlec has been honing his craft by acting like Tracy even when no one's asked him to, like at this Time magazine panel. Click to viewJust replace Jimmy Fallon with the real Robert DeNiro, and we'd totally pay to see Alec as Tracy in Ball Boy.